Philosophy, not politics, was the focus of Ohio Gov. 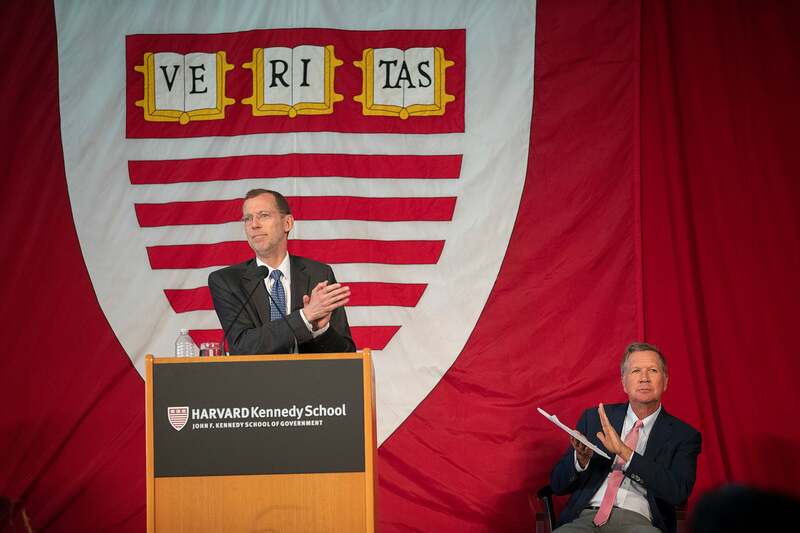 John Kasich’s Commencement address at the Harvard Kennedy School on Wednesday. “This is not a public policy speech,” the 2016 Republican presidential contender told the graduates at the outset. Though he touched on some current political issues, including gun violence, Kasich’s main message challenged the audience to reach for deeper purpose. Kasich said he personally rejects existentialism and sides with the theologians who found a need for a moral compass, despite the consequences faced by some of them, such as the Rev. Martin Luther King Jr. and the German dissident Dietrich Bonhoeffer. “When I hike with my friends and want to get out of the woods, I don’t want to hear their opinions. I want to know who is carrying the compass. And I need to have a compass in my life,” he said. “Christians, Jews, and Muslims all have the same view of human life: that the creator made human life above all else, and that it is our duty to reflect the creator, and to realize we are all made in the image of God. If you think about that, it means we have no right to dismiss or alienate any other human being. It means we must show respect. Gonzalo Huertas (from left), Nikita Taniparti, and Zain Shahid, all M.P.A./ID '18, celebrate before Kasich's address. Answers for the future won’t come from politicians or from Hollywood, Kasich said. “We keep hoping that someone is going to come along and solve all our problems, and you might as well wait for Godot.” Instead, he said, his faith is in the graduates and their generation.